Romajidesu 2.0 has officially launched! I am really happy to announce that RomajiDesu English Japanese dictionary version 2.0 has officially launched after several weeks of hard working! The new version is really a out-standing one with a lot of new features and stuffs which are optimized in terms of look-and-feel and performance. So what's new about the new version? The first innovation is the new English Japanese dictionary, the former dictionary result has been replaced by a much richer content with related words, relevant examples and a beautiful layout (Fig. 1). The performance also increases dramatically thanks to the intelligent caching. A brand new Kanji dictionary has been included. The Kanji dictionary is empowered with an advanced Kanji search form and a multiple Kanji lookup methods. Without complicated input as other dictionary out there, here you can search for a Kanji directly, or by English meaning, or number of strokes, or a specific grade, etc. The result page will high-light popular (joujou) Kanji and put the English meaning there for you (Figure 2). Figure 2. A sample result page for Kanji Lookup. The Kanji Detail page is real deal with lots of useful information such as ON reading and KUN reading, related Japanese words and meanings,...and a nicely rendered stroke order diagram. (Fig. 3). Figure 3. 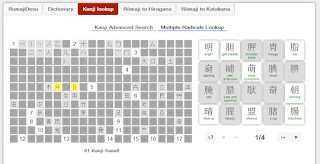 A sample result page for Kanji Lookup. 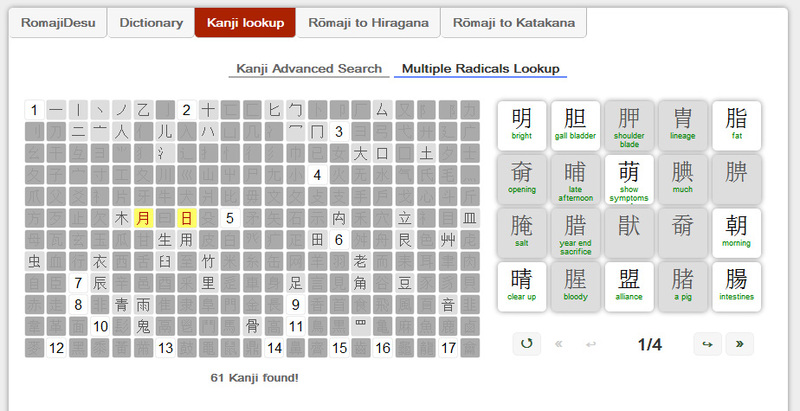 Last but not least, the Kanji dictionary includes a powerful Multiple Kanji radical lookup methods. The result page is also use the smart card display which include a short English discription (Fig. 4). So if you are a Japanese learner, check it out and I strongly believe that you will love it. But if you have any suggestion of how to improve the dictionary, please leave a comment here. P/S. The section Japanese to Romaji has been remove from the homepage temporarily because I want to improve it in terms of accuracy and performance. If you are capable of implement such thing, please contact me.